Safe to use on Chrome, Brass, Gold Plated, Stainless Steel, Ceramics, Tiles, PVC & Plastics. Whirlpool bath owners, we know how horrid it is when you discover nasty floaty bits in your luxury Jacuzzi style bath, so we have developed a tried and test whirlpool cleaner that flushes out the pipe work & pump system leaving you with a fresh & clean bath for all the family to enjoy. Pure Spa Whirlpool Cleaner is specially formulated to help remove the build up of grease, body oil deposits, soap scum & general grime & slime from your whirlpool system pipework & pump. It is essential to regularly clean and sanitise your Whirlpool bath in order to minimise the growth of bacteria and to control the build up of bath deposits that can accumulate in the pipework - even if the system isn't used very often. For regular cleaning use every 3-4 weeks or as necessary. For best results, use regularly & in conjunction with Pure-Spa Sanitiser Tablets. Some foaming will occur so never leave unattended, always close the air valve/turn to minimum whilst the whirlpool system is running. For more info please see Help & Advice centre for articles and FAQs. Pure-Spa Whirlpool Cleaner & Degreaser and Pure-Spa Sanitiser Tablets have been specially formulated to help keep your Whirlpool bath & system clean, fresh and hygienic. Natural use of a Whirlpool or Spa bath will cause the system to become dirty over time, this can be due to the residue of soaps, bath additives, grease & body oils etc that can build up inside the pipework & fittings as a layer of slime. 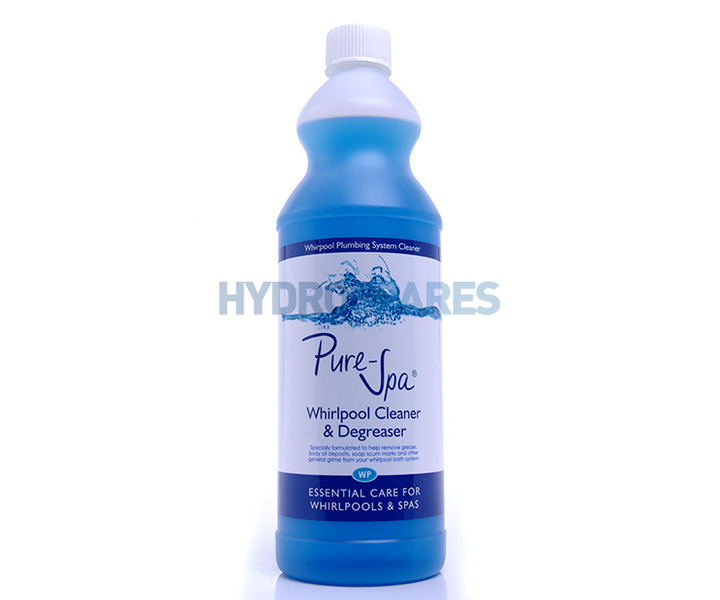 Pure-Spa 'Whirlpool Cleaning & Degreasing Fluid' helps to clean the whirlpool system in a hygienic manner, & is specially formulated to help remove the build up of these pollutants from the system. In between cleaning applications the regular use of Pure-Spa 'Whirlpool Sanitiser Tablets' will help to treat your system effectively to minimise the growth of bacteria, thereby leaving your Whirlpool bath system fresher & more hygienic after each use. For an intensive/purge clean eg. if your bath has not been cleaned in some time, this product can be used up to max dilution of 80:1. This could mean using half - one full bottle of cleaner per application, the solution may then be left in overnight. (See user instructions on bottle). Have used this in my whirlpool bath for years. Does the job and smells lovely too. An excellent product. We have been using this ever since we got our whirlpool bath about 6 years ago. It does an excellent job of giving the pipes, pump etc a deep clean. We use this in conjunction with using the sanitiser tablets after each use of the bath and they do an excellent job of keeping everything clean and smelling fresh. I have used Pure Spa Whirlpool Cleaner & Degreaser for the last 12 years or so and it definitely does the job. It keeps the pipes and jets of my whirlpool really clean and stops the build up of grease etc., which can lead to black, floaty bits in the bath water. Excellent product. Which leaves the jets and the bath itself sparkling clean. Very fast delivery too. Would definitely recommend. Used this every 6 weeks since the bath was installed in June 2016. Leave the solution in overnight to ensure thorough cleaning. excellent product. Cleaned the system as promised and quick delivery. EXCELLENT product -- does what it says and smells lovely too. I have been using the cleaner since I got my bath in 1988. Your cleaner does a great job! It leaves a shiny bath with a lovely fresh smell. Fast and efficient service too. Even send me an hour's slot when delivery will be made. Pure Spa Whirlpool Cleaner & Degreaser is very easy to use and leaves my spa bath lovely and clean. Have been using this product for over a year now. Thanks. 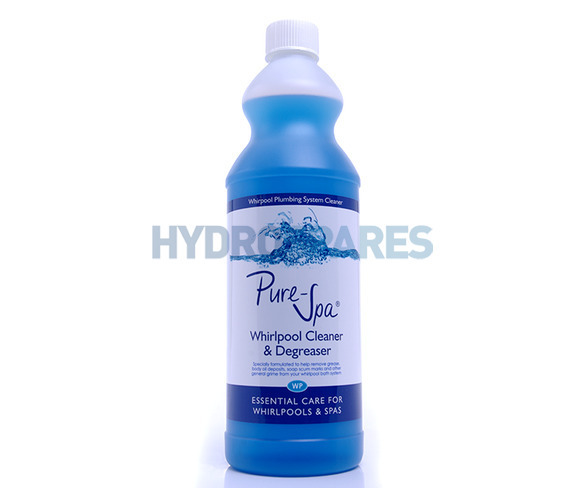 Pure-Spa Whirlpool Bath Cleaner & Degreaser does what is says on the bottle; excellent product! Pure Spa Whirlpool Cleaner & Degreaser The best product on the market and we tried lots of others! Fast efficient service. Received items quickly. Cleaning fluid worked really well and smells very fresh. Sanitiser tablets have a slight bleach smell and that reassures you that they are doing their job. I will buy these products again from this company. GOOD PRODUCT, WORKS WELL AND SMELLS NICE TOO! This is a very good product I am a repeat customer highly recommended this item and it smells very nice. great product. would recommend above other brands. great products and a very good company to do business with. also very fast delivery. thanks pure spa!!!! What a great product ! used it a few times now and I no longer have black bits, tried every thing else from bleach to dishwasher salts with no joy. Dont waist your time using anything else!! Fast delivery also.